The awesome and legendary 1964 mustang was introduced to the world on April 17, 1964, at the New York's World Fair. The day prior, the new Ford Mustang was the pace car at a stock car race in good ole Alabama. Shortly thereafter the car appeared on the covers of Time and Newsweek and its popularity skyrocketed! Ford started pumping the world with advertisements which landed in more than 2,600 newspapers and on the major television networks. Four million+ people visited showrooms, and over 22,000 cars were ordered on the first day the 1964 1 2 mustang debuted! First-year sales were close to 420,000, beating previous sales records of any one model in the history of the automobile. The Mustang was chosen to pace the Indianapolis 500 in 1964. The beginning Mustangs produced for roughly the first six months or so were canned as 1964 1/2 or early 1965 Mustangs. All of the VINs began with the number 5, referencing the model year 1965. The easiest way to distinguish a 1964 1/2 Mustang from a 1965 is that the front edge of the hood was roll under in 1965 which was not the case in 1964. 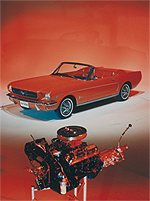 In 1999 the USPS produced a stamp which featured a 1964 1/2 Mustang convertible. In our opinion there are few cars of the 1960's that even come close to this "American Icon" I'd rather drive a 1964 mustang convertible any day of the week over today's pocket racers. Check out Ford.com for more exciting information!